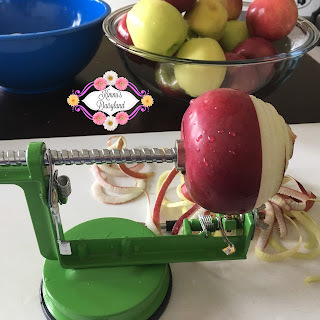 Have you ever made Homemade Applesauce? If not, add it to your 'to do' list during apple season and you'll have delicious applesauce to enjoy all year long (if you can it or freeze it). This recipe is fairly easy to follow and you can use whichever apple varieties you like best. Add cinnamon and nutmeg for more of an apple pie taste and you have an easy dessert in no time. It's also great for breakfast and for use in other recipes. Washington State is known for its apple orchards and is a national leader in apple production, so it may come as no surprise that a lot of Washingtonians have apple trees even if they are not an apple orchard. We have a few apple trees in our yard that are great for a quick and nutritious snack in the summer or for making apple sauce and other apple recipes. Our cows love them too. I pick up the apples that fall on the ground and take them to our cows. They are the best treats! Our cows love their fruits and vegetables. Besides apples, they like corn cobbs, corn husks, watermelon rinds, pears and a lot of other things from our garden. For more about that, click here. My family loves to can fruits and vegetables every summer and I learned how to do this a few years ago. 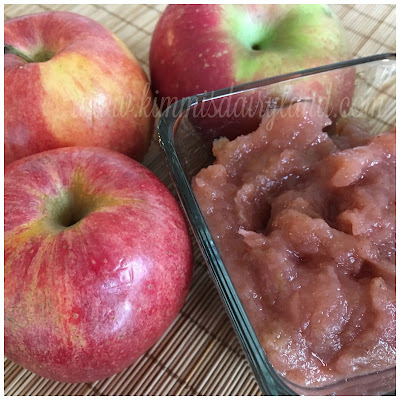 If you know how to can or want to learn, you can make this applesauce recipe and then can it. Make sure all the jars seal after they come out of the pressure canner/water bath. If you want chunky applesauce, you can skip this step. For smooth applesauce, cool mixture and place in the blender. Once it's the consistency you want, add cinnamon and nutmeg if you'd like. I didn't do that for the batch pictured but have with other batches in the past. Great tips about how to add the sugar. Otherwise, I am sure I would end up with VERY sweet applesauce! Sharing on Desserts Required's FB page this weekend. Thanks so much for sharing! Sorry I just saw your comment. I ended up with VERY sweet apple butter last summer. It's still perfect for pork chops, but a tad too sweet for toast. Great applesauce tips! Thanks for linking up on the #Celebrate365 Blog Party!